SIZZLING (AUS) (Bay 2009-Stud 2014). 7 wins-5 at 2-from 1000m to 1600m, A$1,332,375, BRC TJ Smith S., Gr.1, Champagne Classic, Gr.2, Sires' Produce S., Gr.2, Queensland Guineas, Gr.2, Gold Edition P., L, GCTC Ken Russell Memorial Classic, L. Out of SP Admirelle. Grandson of SW Laudemio. Sire of Sizzling Belle, Sugar Sizzle and of the placegetters Burbank, Line Up Girls, Scorch, Sizzleonthebridge, Too Hot to Hold, etc. His oldest progeny are 2YOs. BALMORAL BABY, by Red Ransom. 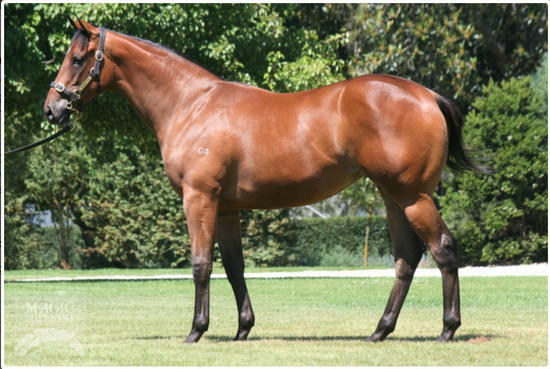 3 wins at 1350m, 1600m, Ipswich TC Sirromet 5 Star Winery H. This is her first foal. Balmoral Baby. 3 wins. See above. Gold Artisan. Winner at 1200m in 2016-17, 2d MRC Sheen Group H., 3d ATC Membership H., Theraces H., Tab.com.au H.
Roger Ramjet. 2 wins at 1200m in Aust. Gran Sabana. Placed to 2016-17, 2d SAJC Farmer's Union Iced Coffee P.
Cavalente. Placed at 2 & 3 in Aust. Pemberley (Darci Brahma). 7 wins from 1400m to 2050m, A$272,265, to 2017-18, VRC Japan Racing Association H., Summer Series H., 2d Ballarat TC City of Ballarat H., 3d Brisbane Cup, Gr.2, MRC Herbert Power S., Gr.2, Stony Creek Cup, MRC Polytrack H.
Outshine (Darci Brahma). 4 wins from 1400m to 2000m, NZ$13,375, A$76,675, 2d CJC Canterbury Belle S., L, Cranbourne TC Pinker Pinker P., 3d MRC Smart Track Australia H.
Rocbolt. 6 wins from 1500m to 2050m, A$119,350, to 2016-17, MVRC Mayoral Charity Community H., SCTC Coastline BMW H., 2d GCTC Direct Connect H., 3d BRC Sky Racing P., Construction Skills Qld H., Brc.com.au H.
Netherfield. 3 wins from 1400m to 1800m, A$112,250, to 2017-18, MRC Allan Wicks H., 2d MRC Chef's Hat South Melbourne H., Ladbrokes Info Hub H., 4th SAJC Chairman's S., Gr.3. El Pauji (Flying Spur). 6 wins. See above. Gently Bentley. 5 wins-1 at 2-to 1250m, A$153,095, STC Rosehill Gardens Event Centre H., Macquarie Underwriting 2YO H., TRC George Self Property H., Paul & Elizabeth Geard H., Tasmanian Hospitality Association H., 2d TRC Lanesborough Room H., TTC Examiner Newspaper Fashions on the Field H., AJC Cadbury Schweppes H., Dover Heights H., STC Become a Member H., 3d AJC Inglis Classic Sale February H., UD Trucks H., Wilson Asset Management H., Broker's Tip H., STC Frank Dowling Memorial H., Parramatta Lord Mayoral H., Golden Slipper Festival H., TTC Tote.com.au H.
Coeur d'Amour. 3 wins from 1400m to 1800m, MRC Betfair H., 3d MRC Ahern's at Highways H.
City Honours (Darshaan). Winner at 2, £395,764, Doncaster Amco Corporation 2YO S., 2d The Derby, Gr.1, Irish Derby, Gr.1, York Dante S., Gr.2, 3d Ascot Royal Lodge S., Gr.2, 4th Newbury Washington Singer S., L. Sire. Arroz Branco (Elusive Quality). 3 wins-1 at 2-from 1500m to 2400m in Brazil, 2d Cidade Jardim G.P. Sao Paulo, Gr.1, 4th Cidade Jardim Classico Presidente Firmiano Pinto, L.
LIM'S RACER (Red Giant). Champion 2YO in Singapore in 2016. 3 wins to 1200m, S$262,192, to 2017, Singapore TC Aushorse Golden Horseshoe, L, Class 4 H., 3d Singapore TC Class 3 H., RDA Cup.